David Williams was born on August 24, 1941, in Florida. He was commissioned a 2d Lt in the U.S. Air Force through the Air Force ROTC program on June 6, 1964, and went on active duty beginning July 11, 1964. Lt Williams next complete Undergraduate Navigator Training and was awarded his navigator wings at James Connally AFB, Texas, in July 1965, followed by Electronics Warfare Officer (EWO) training at Mather AFB, California, from July 1965 to March 1966. 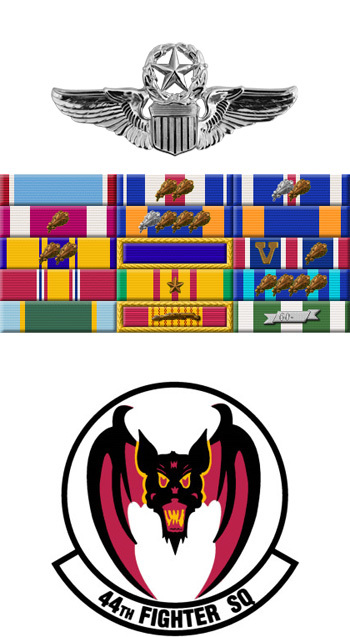 His first assignment was as an EWO with the 4758th Defense Systems Evaluation Squadron at Holloman AFB, New Mexico, from March 1966 to June 1967, and then as an F-105F Thunderchief Wild Weasel EWO with the 13th and then the 44th Tactical Fighter Squadron at Korat Royal Thai AFB, Thailand, from June to December 1967. His next assignment was as a Wild Weasel EWO Instructor with the 4538th Fighter Weapons Squadron at Nellis AFB, Nevada, from January to August 1968, followed by Undergraduate Pilot Training at Craig AFB, Alabama, where he earned his pilot wings in August 1969. Capt Williams then completed Pilot Instructor Training before serving as a T-38 Talon Instructor Pilot with the 3525th Pilot Training Squadron and then 3526th/82nd Student Squadron at Williams AFB, Arizona, from January 1970 to June 1973. His next assignment was as an Instrument Instructor Pilot with the U.S. Air Force Instrument Flight Center at Randolph AFB, Texas, from June 1973 to July 1975, followed by Air Command and Staff College at Maxwell AFB, Alabama, from August 1975 to June 1976. LtCol Williams served as an Operations Staff Officer in the Office of the Deputy Chief of Staff for Plans with Headquarters Air Training Command at Randolph AFB from June 1976 to April 1980, followed by service as Commander of the 454th Flying Training Squadron of the 323rd Flying Training Wing at Mather AFB, California, from April 1980 to June 1982. His final assignment was as Chief of the Programs Division with Headquarters Air Training Command at Randolph AFB from July 1982 until his retirement from the Air Force on December 31, 1984. 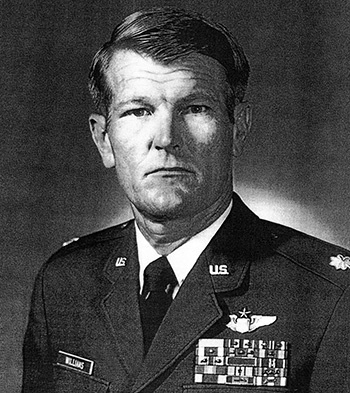 Captain David H. Williams distinguished himself by extraordinary heroism in connection with military operations against an opposing armed force as the Electronics Warfare Officer for the leader of an F-105 Thunderchief flight attacking a vital military target in the vicinity of Hanoi, North Vietnam on 27 October 1967. On that date, with his aircraft hit and burning, Captain Williams exhibited the highest order of courage as he continued to guide his pilot through intense and accurate antiaircraft fire to attack and destroy a hostile surface-to-air missile complex that was threatening a large F-105 strike force. With his aircraft still in flames he assisted his pilot in initiating rescue efforts for a wingman down in the target area. Captain Williams then constantly provided positions as the pilot flew the crippled aircraft 300 miles to a skillful emergency landing. Through his extraordinary heroism, superb airmanship, and aggressiveness, Captain Williams reflected the highest credit upon himself and the United States Air Force.